Asking questions but not getting any answers, a truck driver maneuvers his vehicle into a quarantine checkpoint, and then runs a deer over on his way out. Left for dead, the animal springs back to life a minute later as if nothing happened, except that its eyeballs are now all white. Novice fund manager 석우 (공유) juggles his time between making it big and trying to win his daughter’s affection by showering her with material things, but she is not impressed. All she wants is to go back home to her mother in Busan, so much that she is willing to take the southbound KTX from Seoul all on her own. Realizing that he is just pushing his child further away, he decides to accompany her so she can be reunited with his estranged wife. As the doors of the train close, a visibly injured girl dashes in last minute and drops on the floor convulsing, before lying motionless on the ground. Panicking, a train attendant shouts for help, too distracted to see the now reanimated zombie lunge for her jugular. The zombie genre has reached its saturation point, to the extent that new releases no longer elicit any form of surprise or anticipation from the general public. This is why persistent filmmakers who insist on sharing their zombie narratives have to come up with something more convincing. 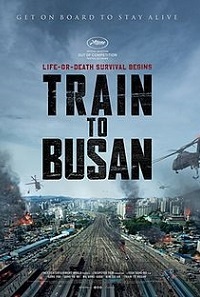 Train to Busan does not add anything new to the tired genre. Even the ensemble of characters is archetypal at best, and we only ever get to know them in a shallow manner similar to meeting someone on a KTX train from Seoul to Busan, with the clear exception of 석우. But then again, he IS the main character. However, even the weakest narrative can be transformed into something worthwhile depending on the presentation. This film does not just present. It goes the extra mile. Whoever was in charge of sound mixing deserves a round of applause. Instead of jump scares that are more appropriate for the horror genre, they rely on startle response courtesy of abrupt and loud sound effects that will keep you at the edge of your seat. This trick easily gets old when abused, but the interplay between image and sound in this film is rendered smoothly enough that they end up complementing each other. The result is that of an adrenaline-inducing audiovisual experience, making you feel as though you were on that train trying to survive with everyone else. What makes the film so effective in spite of the cliché man-versus-zombie plot is the setting itself. Instead of a post-apocalyptic scenario, they opted to focus on the onset of the outbreak, which is arguably the best angle to highlight because it is simply more relatable. There hasn’t been a zombie apocalypse to date, but yes, we all do take trains for our daily commute. It’s not too difficult to imagine this scenario happening anytime in our mundane daily lives. Of course, the situation would vary per city. A zombie outbreak in Manila, for example, would be as rapidly disastrous as it is unexciting. Given the jam-packed trains that we have, biting one another at such neck and neck proximity would be too easy, but then not a lot of running would be involved because you could barely move in there. It’s also thought-provoking to imagine the repercussions such an event would entail as far as international relations is concerned. Korea is a peninsula, not an island. A zombie outbreak would most likely head north given their limited mobility in bodies of water. It won’t take long before the hermit kingdom up there is transformed into a hungry cavalcade of the undead. What will Beijing do once an army of Korean zombies starts marching to Dandong? Now that’s an unprecedented twist for the current discourse on contemporary migration issues. As for the cinematic experience as a whole, I recommend seeing the movie in a packed cinema. Audience impact would most likely be enthusiastic. I saw it during the earliest screening at 11 AM, which meant that there were less than ten of us at the time. Even so, the woman on the upper row was screaming her lungs out as if her head was being repeatedly pounded with a jackhammer. Imagine a hundred more like her seated next to you. Have fun.